An account of what it was like to live in a Victorian body, bringing the reader through the realms of social history, medical discourse, aesthetic practise and religious observance. ...[a] dazzling experiment in life writing ... Every page fizzes with the excitement of fresh discoveries, as Hughes applies her magnifying glass to the tiniest of clues and makes whole new stories spring into life ... What is new here is Hughes’s verve and sheer nerve in encouraging us not just to become more aware of her subjects’ bodies, but also to slip into their skins. Elegantly sidestepping the usual cliches of Victorian history, from foggy streets to whimpering urchins, each page becomes a window on to a world that is far stranger than we might expect. It is writing that takes the raw materials of everyday life, starting with the body’s 'bulges, dips, hollows, oozes and itches,' and makes them live again ... as Hughes proves in precise and loving detail, the Victorians were not at all the legless angels and whiskery prigs of legend. In fact they were exactly the same blushing, flinching, throbbing, easily bruised creatures that we are. Hughes has prodded and probed at the official record, looking at letters, diaries, notebooks, newspapers and archives. All the way through, she challenges the assumptions that over the years harden around lives in the telling of them, pointing out that early biographers are as much part of the story as their subject. In at least two chapters, she finds evidence that dramatically changes the story, that reclothes the myth in flesh and blood. 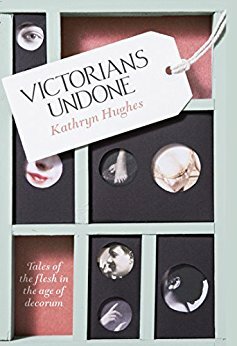 Victorians Undone is a work of formidable scholarship, but Hughes has a fluid, jaunty style that propels the reader from idea to idea. Reading it is like unravelling the bandages on a mummy to find the face of the past staring back in all its terrible and poignant humanity. It is rich and scholarly, something fascinating to be discovered on every page. But it is also digressive, meandering. Her stated theme – how did the men and women whose tales she tells feel about their physical selves? – comes in and out of focus. Each essay works beautifully alone. Hughes is a thoroughly engaging writer: serious-minded but lively, careful yet passionate. In its entirety, though, it feels strained, uncertain of itself. The pieces do not quite fit together ... None of this is to say that I didn’t enjoy Victorians Undone. Some of the encounters in its pages, whiffy and indelible, will stay with me for ever. What did you think of Victorians Undone: Tales of the Flesh in the Age of Decorum?